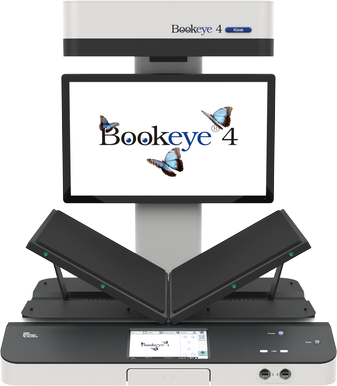 Bookeye® 4 V2, the newest member of the Bookeye® family of overhead book scanners, is available in the versions Basic, Kiosk, Office and Production, all of which are ideal for scanning formats A2 and slightly larger. The Basic, Kiosk, Office and Professional versions all include feature sets which were defined according to customer requirements. 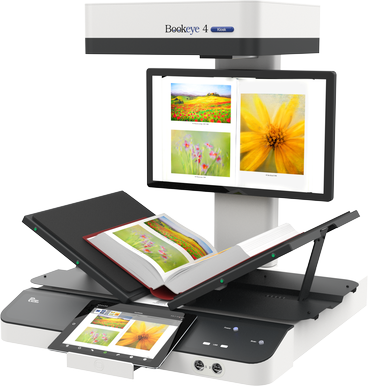 Bookeye® 4 V2 Basic is our cost effective entry level model, scanning with 400 dpi resolution in grayscale. Bookeye® 4 V2 Kiosk is recommended for self service applications in public environments - for the occasional user who wants a quick and uncomplicated digital copy. Bookeye® 4 V2 Office can be implemented as a shared departmental scanner. The fingerprint authentication function enables complex workflows. Bookeye® 4 V2 Professional is ideal for both large and small digitization projects. Using the capturing software BatchScanWizard (BSW), Bookeye® 4 V2 Professional delivers brilliant scans of double sided A4 documents in less than 3.5 seconds with 600 dpi optical resolution. An optional TWAIN driver integrates the Bookeye® 4 V2 Professional with any capturing software on the market. Bookeye® 4 V2 Professional Archive is suitable for digitization projects that require high quality and maximum productivity even in a 24/7 operation environment. As a special add-on to the Professional, there is a horizontally movable V-glass plate, with which the scan template can be positioned exactly in the book fold. Bookeye® 4 V2 Semiautomatic adds a motor-driven V-glass plate to the features of the Professional Archive, which can easily be removed without tools or the need for a service technician. All Bookeye® 4 models are equipped with a V-shaped book cradle, a built in touchscreen and a preview screen to control the scanned images. The integrated computer with a fast GBit network connection enables using the Bookeye® 4 V2 as a standalone unit or an integrated part of any existing infrastructure - simple and straightforward. The integrated V-cradle can be locked at a 120 degree angle. Source documents can be scanned in folder mode, either lying flat or in the more gentle V-cradle position for highly sensitive historical books and other source documents. The V-shaped book cradle reduces the risk of damage to the spine and binding, making archiving and digitization a less invasive process. 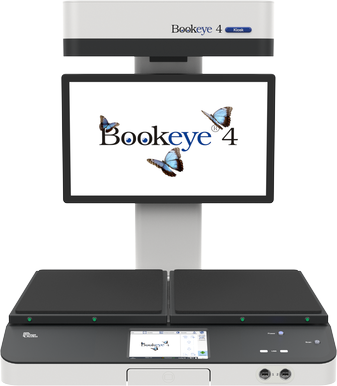 The innovative features of the Bookeye® 4 V2, its functionality and also the competitive price establish the Bookeye® 4 V2 as a universal book scanner and book copier for a large user group from libraries, archives and the private sector.